The pale yellow petals and flat, wide blossoms of this Miltonia bring a soft burst of sunshine into your home. Place this lightly scented plant next to your bedside for a pleasant, aromatic greeting each morning. The plant is approximately 12 inches tall and shipped with 3-5 buds, which will bloom for up to 4-5 weeks. 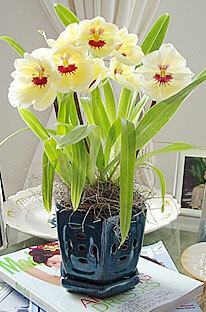 Accentuate the beauty of your potted yellow Miltonia with this delicately glazed Japanese eartheware orchid pot. Own both of them now and enjoy! For container, view BASKET or choose below. The yellow Miltonias's availability is based on limited supplies and at times will not be available. If this hybrid is currently unavailable, you will be contacted prior to any substitution. Feel free to contact us and we will inform you of the exact quantities we have on hand at 1 877-2 ORCHID (267-2443).